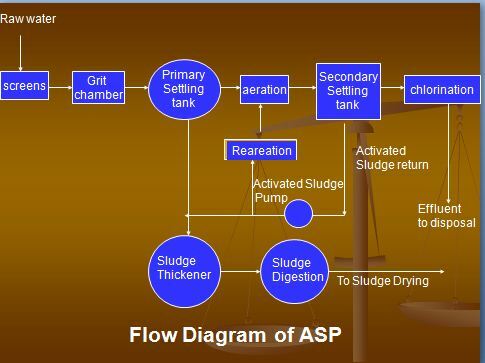 Activated Sludge Process is the suspended-growth biological treatment process, based on providing intimate contact between the sewage and activated sludge. The Activated Sludge is the sludge obtained by settling sewage in presence of abundant O2 so as to enrich with aerobic micro-organisms. Oxidation of organic matter present. Conventional plug flow: –Settled water and recycled activated sludge enter the head end of the aeration tank and are mixed by diffused air or mechanical aeration. During the aeration period adsorption, flocculation and oxidation of organic matter occur. Modified aeration: –It is similar to conventional plug flow except that shorter aeration time and higher F/M ratio are used. Tapered aeration: – Varying aeration rates are applied over the tank length depending on the oxygen demand. Greater amounts of air are supplied to the head end of the aeration tank, and the amount diminishes as the mixed liquor approaches the effluent end. Step feed aeration:-Generally three or more parallel channels are used. The settled waste water is introduced at several points in the aeration tank to equalize the F/M ratio, thus lowering peak oxygen demand. Extended aeration: – It operates in the endogenous respiration phase of the growth curve, which requires a low organic loading and long aeration time. The new cell produced undergoes an auto oxidation which involves the breakdown of organics in cell itself to produce energy for the maintenance of remaining cell mass. Thus, there is continuously a fractional decrease in cell mass with time. Complete mixing in aeration tank. Influent substrate concentration is constant. No microbial solids in raw water. All reactions occur in reactor. No microbial activity in clarifier. Power Point Presentation with solved examples has been embedded below for better understanding.